UniSat 7 is a technology satellite built at GAUSS Srl. It is intended to test customer equipment under space conditions and to deploy Cubesats and PocketQubes in orbit. The UniSat-7 features a new octagonal prism satellite platform built from reinforced aluminum and carbon honeycomb panels. It is 3-axis stbilited. Power is provided by body-mounted solar panels. 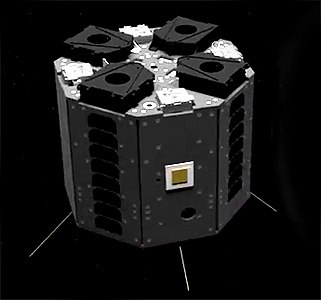 A wide angle camera is on board to acquire imagery of the deployment sequence and a nadir facing camera to image the earth. The satellite features four 3U CubeSat deployers and four deployers for PocketQubes (among them Arduiqube). Launch was planned for the second half of 2016 on a Dnepr rocket as part of a multi-satellite mission. As the availability of Dnepr had become doubtful, the satellite was delayed to 2019 or 2020 to be launched on a Soyuz-2-1a Fregat-M rocket. UniSat 7 - 2020 Ba Soyuz-2-1a Fregat-M with CAS500 1, Arduiqube, FEES, Unicorn 1, ?